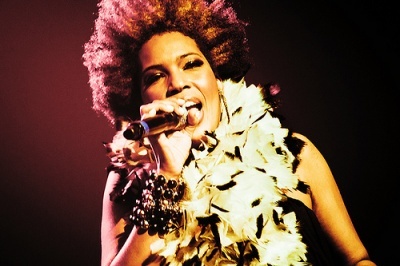 Macy Gray's concert at AB Brussels was a great party - despite her own appearance. The playlist included some surprising covers... Nothing Else Matters (Metallica), We Are The Champions (Queen), Creep (Radiohead), etc. Macy herself was clearly under the influence, but her team and their continued drive more than made up for her own shortcomings. From the very beginning, the vibe was there - and the crowd was clearly ready for a party. Her backing singer and the electric guitar player were outstanding - saving the day. The encore was clearly not in the plan, and was kept to a minimu. Overall, a very enjoyable evening - but it could have been (even) much better (especially given the steep 34 Euro tickets) !